Surface studied by Kummer in 1864. Ernst Kümmer (1810 - 1893): German mathematician. 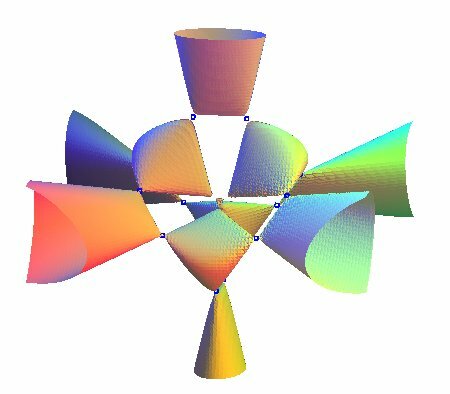 so that pqrs = 0 is the equation of the union of the extended faces of a regular tetrahedron centered on O and the edges of which are at distance a from O (cf. figure on the right). 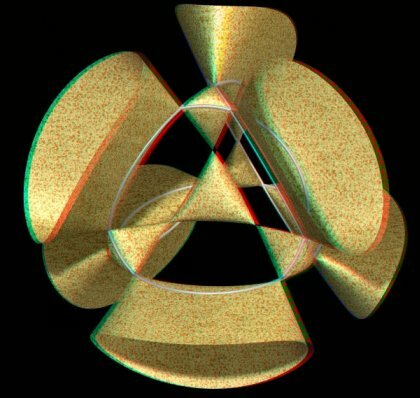 REMARK: the Kummer surface passes through the intersections of these 4 planes and the sphere . 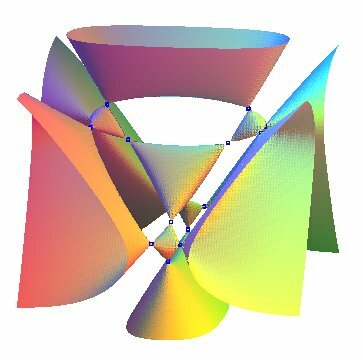 Compare to the Klein quartic. The Kummer surface is the surface with the above equation; when , it has 16 ordinary singular points (i.e. non degenerate), the maximum number for a quartic surface; the 16 points are real for . Opposite, view of the case , so ; the surface is composed of a central "tetrahedron", extended by 4 small "tetrahedra", themselves linked by 6 infinite sheets, in parallel with the 6 "edges" of the central tetrahedron. The 16 singular points are the "vertices" of the 4 small "tetrahedra". 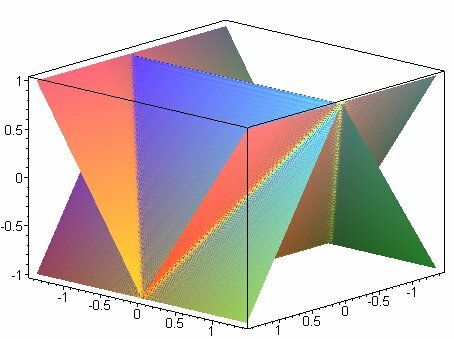 If the coefficients of the homogeneous terms above are replaced by any coefficients, then we get the general equation of the surfaces of degree 4 that have the symmetries of the tetrahedron or the cube (see Goursat surface). Furthermore, the terms "Kummer surface" can refer to any quartic surface with 16 ordinary singular points. See also the Barth sextic, which is the degree 6 equivalent of the Kummer surface. 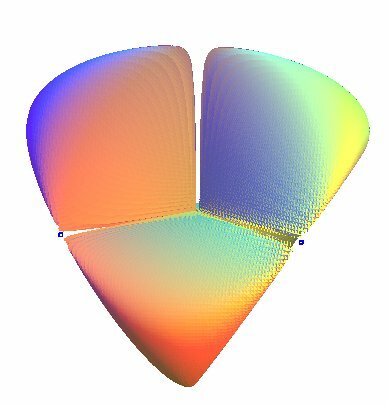 Compare to the Klein quartic (curve). anaglyph 3D image to watch with red-cyan glasses.